"The Art Of The Prank"
A man walks into a joke shop and gives a password. A trapdoor opens beneath him and the man finds himself hanging from the ceiling in front of the Prankster. The messenger tells Prankster to meet his boss outside. The Prankster goes outside to meet Nitro G, a metahuman who can manifest nitroglycerine and throw it. He tells the Prankster that he needs a distraction while they pull a job. Prankster returns to his lair and plans his prank. When the time comes, he covers the streets with banana peels during the Metropolis Marathon. When the police arrive he sprays them with huge squirting flowers. Superman arrives on the scene, but Prankster's protective bubble electrocutes him. As Superman recovers and goes to free the police from the glue sprayed on them, Prankster escapes. That night, Prankster watches the news report of Nitro G's exploits. The next day Prankster wakes to another messenger, with Nitro G waiting outside. Nitro tells Prankster that this time he wants some of Prankster's glue flowers. When Prankster refuses, Nitro threatens him, and he concedes. Back inside his lair, Prankster plans his next move. Later that week, Prankster begins by dropping money all over the city. Nitro G attacks a bank, but quickly finds Pranksters gadgets interfering with the heist. When Prankster arrives they try to use his guns, but find they've been sabotaged. Prankster covers Nitro G in a coating that effectively turns him into a stick of dynamite. Superman arrives just in time to save Nitro from exploding. In the chaos, Prankster activates his holographic disguise and slips away. Prankster relaxes in his lair. He contemplates taking a job in Keystone City, but he doesn't want to leave Metropolis, because it would mean leaving Superman. Story - 4: My abbreviated summary really doesn't do this issue justice. Sure it's a filler issue, but it's also a great filler issue. This continues more of what Busiek has been doing since he came on the title: fleshing out Superman's world with allies and villains that don't disappear at the end of the issue. 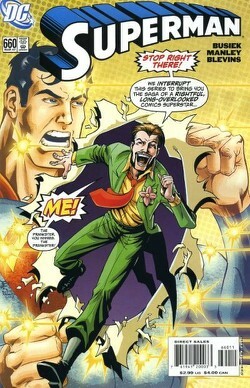 With one simple, self-contained story, he re-established the Prankster as a legitimate character and gives him a reason to be operating in Metropolis. Prankster is a hard character to handle. He was created in a very different time, and the idea of a villain who spends his time pranking Superman isn't a great one. But Busiek really handles it well. My favorite part of this issue though, is the fact that it was a one-shot. As great as Camelot Falls is, it's very nice to go to the comic store, buy an issue and get a complete story. From what I've read online, Busiek has long-term plans for Superman, and I'm quite happy that he won't be going anywhere. Art - 3: Here is a place that unfortunately suffers in a filler issue. The art is passable in this issue, and Manley does a perfectly average job, but Pacheco he's not. I did like his panel layout a lot though. It's different, without distracting from the story. Guest artists are always unfortunate, but I really have to give DC credit for what they're doing here. A lot of books have been delayed, and I'm glad they're doing something to get back on a monthly schedule. Cover Art - 4: As a rule, I hate speech on covers, but I have to let it pass for a character like the Prankster. Nothing about this cover is that spectacular, but it fits the Prankster very well, and for that I like it. I do think his skin is way too pale, and for some reason I think he looks a lot like Jimmy, but aside from that it's just a great, fun cover.